The first in a series of town hall meetings in the Quinte region organized and hosted by the Ontario Secondary School Teachers Federation Local 29 branch discussing the proposed changes by the Ford government to public education was offered at the Picton Town Hall on Thursday. Given the political stance of the organizers and the climate of change in the Ford government, it’s important to understand these sessions that will likely ramp up in intensity in the coming months as sabre rattling becomes part of the ongoing din between the parties involved. However, it’s important to note the Conference Board of Canada ranks Ontario as having one of the best education systems in the world, trailing only Japan and Finland in terms of quality and ensuring that level of excellence doesn’t slip as a result of proposed education cuts in the 2019 provincial budget should have those involved in the secondary school system- parents and teachers alike- wary of what might be coming in the fall. 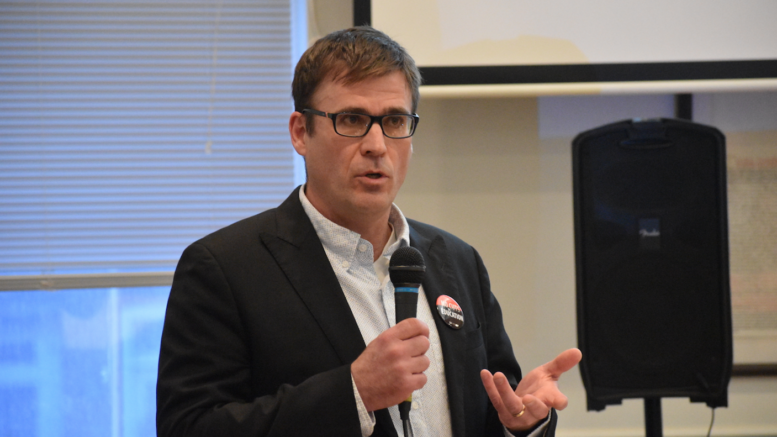 Local 29 district Scott Marshall offered a brief presentation and answered a series of questions Thursday night to about 50 interested parents and teachers, discussing the impacts of proposed cuts to education. Marshall explained altering Ontario’s Pupil Foundation Grant and cutting it by 20 per cent was significant and while much of the verbiage has been about moving the student to teacher ratio from 22-to-1 to 28-to-1, it’s important to note those ratios are averages, meaning if there’s a class with 18 students, there will be invariably be a class somewhere with upwards of 40 students. “Changing the formula that much is going to greatly reduce the number of teachers that are in secondary schools,” Marshall said. While finer details have been vague and slow to emerge from the Ministry of Education, it’s apparent there will also be a reduction in the Grants for Student Needs funding formula as well which means a loss in vital educational assistants and other key support staff including custodians. “In our schools, we have a full team that is working to support students and their education and this reduction will result in a loss of support staff as well,” Marshall added. It’s expected by the OSSTF the push to have four classes delivered to students through e-learning methods will ultimately be centralized, meaning a further reduction of bodies in the schools. In total, based on current enrolment numbers and proposed cuts, the Hastings and Prince Edward District School Board will likely lose at least 60 teaching positions next fall and, if full e-learning classes were fully mandated, it would mean a loss of almost 500 classes. But e-learning is not for every student and Marshall said studies indicate there’s a higher drop out rate with the learning methodology as as opposed to face-to-face learning as some students may not be ready or may not adapt to this form of learning. And in terms of this direction, Marshall said the push for e-learning was void of study and research. “This is not improving education, there’s no studies or research anywhere that we need to start pulling supports from students to help them succeed,” said Marshall. The Local 29 president admitted during the question and answer period that there was definite concern the entire e-learning teaching process could be outsourced to anywhere in the world. From a safety standpoint, a loss of staff also means fewer adults in the schools which translates to less supervision in the hallways and other places where students may find trouble. While it appears teaching unions and the Ministry of Education are headed for darker days when the secondary school teaching staff contract runs its course later this summer, Marshall believes the educational cuts will impinge on the relationship between employee groups and the Hastings and Prince Edward District School Board. While some of the discussion spoke of what would be coming to the schools across the province generally, PECI secondary school guidance councillor Matt Ronan spoke of the experiences and options at PECI to provide a micro understanding of what the school offers. Currently, PECI affords a host of excellent programs including the Venture University Enrichment Program and offer a range of technology programs that prepares students for employment into the Trades. A rich arts program celebrates student’s exhibits each fall and spring and in Practical Learning and Life Skills Programs students are engaged in rich learning opportunities. “On top of developing literacy skills, our students have participated on the Special Olympics, Track and Field and Basketball teams,” Ronan said. PECI is a Science, Technology, Engineering and Math (STEM) school that provides programming in advanced maths and sciences as well as senior level coding and programming that have prepared students for some of Canada’s top universities. Ronan explained school can be a difficult place for some learners and that a ‘bricks and mortar’ school does not always work. As a response to those student’s needs, PECI developed its own alternative program called ‘Designing my Future’. “This program partners with community organizations to help students build self-worth and produce graduates who are proud contributing members of society. We are so proud of those students and recognize the resiliency in spite of the obstacles in their way each day,” Ronan said. Whatever destination PECI students choose, the school offers the programming to get them there and Ronan said staff are quite proud that in a graduating class of just over 100 students, there are 44 college applicants, 37 university applicants and 5-6 students signing as apprentices in the Trades. “For anyone who knows the skilled trades, securing a paid apprenticeship at 18 can be considered as difficult as getting into a premier university,” Ronan said. “As a staff, we have worked hard to ensure our students have access to the programming they need to prepare them for the specific requirements for their future. For instance, our Ontario Ministry of Education provides six different Grade 12 math courses all designed to align to different college, university and apprenticeship requirements. Providing these math courses for over 100 Grade 12 students enrolled at PECI means there would be an average class size of 18-much less than the proposed 28 to 1 ratio the government plans to implement. Ronan wondered if that meant PECI would be forced to have students take internet math through e-learning or will it mean that other classes in the Arts or Technology would be sacrificed? He added it takes a village to provide opportunities for Prince Edward County’s youth and the team of 37 teachers, support staff and community members work together because they understand a student engaged in school becomes a graduate of school and a stronger member of the Prince Edward County Community.